Raveler bonniejacobs is as generous as she is talented. She’s been crocheting for as long as she can remember, but she only picked up knitting (or at least, it finally stuck) a few years ago. Shortly after, she turned her new hobby into a beautiful charity effort to help bring smiles to the faces of homeless children. Last year she knit 49 lovable monsters – most with our Vintage yarn – to donate to children at Union Rescue Mission’s Hope Gardens Family Center in Los Angeles. The handmade toys were such hit that she decided to do it again, this time with the help of other Ravelers. She even designed two free monster patterns to help with the project. Otto and Pockets & Baby both have colorful striping and big googly eyes. They’re not only adorable, but a great way to use up your yarn scraps! 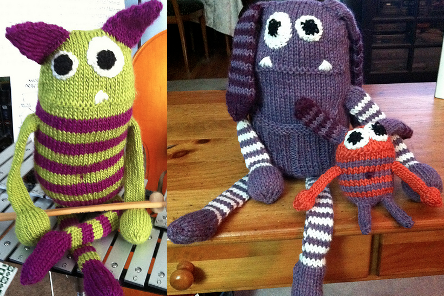 Thanks to these free patterns, the group project produced 83 monsters this year. They were donated last month. Why did you decide on monsters? I wanted to create handmade gifts for the children, something they could love & hug, something to bring comfort, something made from the heart! I decided on lovable monsters that could be cuddled & taken anywhere. What’s your favorite project you ever made? If I had to narrow it down it would be a pair of Mrs. Beeton’s that I knitted for Pauley Perrette (Abby on NCIS). She actually wore them on the show (“False Witness” episode 8×10) and surprised me. It’s so cool to see something you have made on the screen! The second is my Monsters for Hope Gardens because I can be so creative with them & each one in a unique creation. The thought of one of my creations bring joy to a child just warms my heart. There are so many things I want to knit; it’s just about finding the time. I knit a lot for charity, friends & family, and I also love doing RAKs (Random Acts of Knitting) because giving something made with love & seeing the person’s reaction is just amazing. It relaxes me…it’s my destresser. I can take it almost anywhere and work on a project. And I have made so many new friends because of my knitting/crocheting projects. I love being able to give family & friends something handmade that they will truly treasure.